I used Labels 4 and Lacey Squares nesties, Prima Paisley Road notecards, papers and flowers. 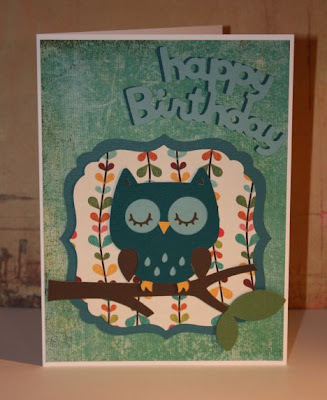 The sentiment stamp is from Hero Arts. Here's another little Tiddly Inker - coloured with Promarkers. and I also printed it through my Craft Robo software and used the auto trace feature to cut it out. The Craft Robo makes a much better job of cutting these things out than I do! Just thought I would also answer this question that someone left in my comments - Helen, I would have emailed you but there was no email address on your blogger profile! I've never used the aquamarkers, I did think about ordering some to give them a try but have resisted for now. I must say though, it was mainly price that made me go for Promarkers over Copics, but I've been happy with them so far! Mind you, I am still learning how to get the best of them, and my husband still laughs at me when I spend an evening "colouring in"! I used my Robo to cut the flourish design, and then stamped the musical background onto some ledger type background and inked the edges with Antique Linen distress ink. I wanted to do something a little bit different so I dug out a couple of these huge Prima flowers, layered them up and stick a few sparkly gems on them. I then puched a little circle and stamped my sentiment on there - I didn't have any any "Hello" stamps so I went with "Sending Happy Thoughts", a hello kind of sentiment, I thought! Some more cards I found on my hard drive! I love these little digital stamps from Tiddly Inks - such cute images and great for practicing with your new promarkers as I was with these! Hope you like! Oh yes, and scuse the rubbish photo, can't wait till the evenings get lighter so I can take better photo's of projects! Have used some Prima papers and die cut note cards, all from the Paisley Road collection. 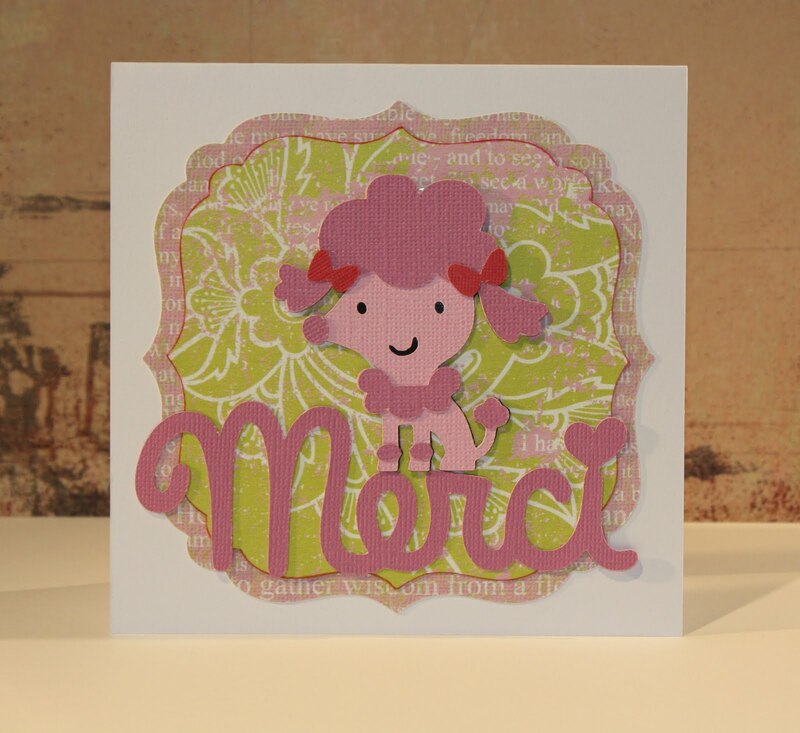 A nestie die cut with Waltzingmouse and Hero Arts stamps, and some little purple buttons with some sparkly gems on top. The last few cards to share from last year - all using the Cricut and the Create A Critter cartridge! This was absolutely by far my favourite layout from 2010! I was totally inspired by a layout by Nichol Magouirk using lots of Silhouette dies cuts, and as I can use those with my Craft Robo too I thought I would give it a go. Papers and puffy letter stickers are American Crafts. I'm not sure if you can read the journalling on the page but it is just detailing Jamie's latest words as he was starting to talk more and more in August 2010 - mainly about cars, dig digs and books! 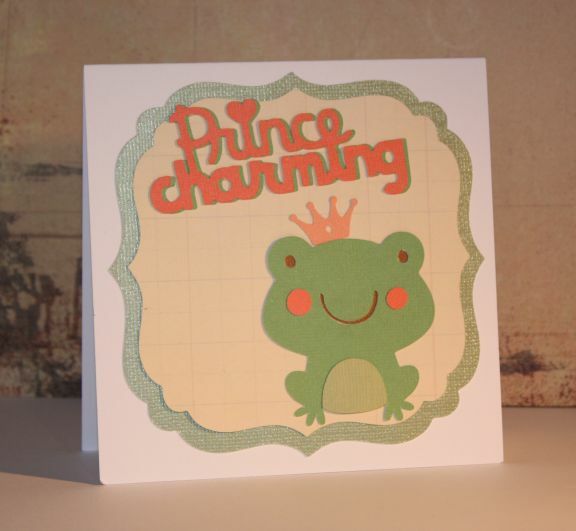 Here's a little card using the cute little froggy from the Create a Critter Cricut Cartridge (blimey, try saying that three times fast!). I embossed the pearlised yellow card with my Cuttlebug swiss dots folder. The label is from Nestabilities Labels 4, and the stamps are from WaltzingMouse / Hero Arts. I used milled lavender distress ink (so not quite lilac, but never mind!) and a couple of little flowers from my stash. A layout from last year, with pictures taken the year before! It's a good job I don't worry about falling behind with my scrapbooks ha ha! Here's Jamie thoroughly enjoying himself with a box, a cardboard tube and a remote control. 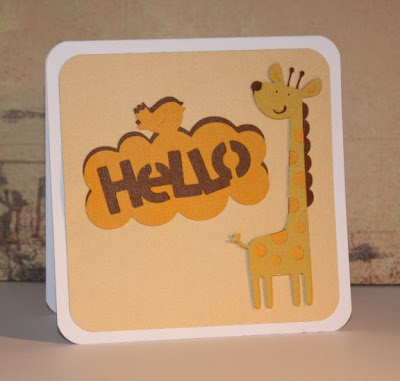 Patterned papers are American Crafts, loopy border using a Martha Stewart punch, dinosaur from the Create a Critter cricut cartridge. I actually didn't take many photo's on Christmas Day, I was busy helping the boy to open his presents in the morning and then spent quite a lot of time in the kitchen preparing and cooking Christmas dinner! Never mind, I got a few, and was particularly fond of the one in the middle of this layout, I think I had asked him for a smile and this is what I got in return! The journaling reads as follows..."Christmas Day 2010 – Jamie was not quite two so still not entirely sure what was going on, but after we had all opened the first couple of presents together he definitely got into the swing of things! Father Christmas brought lots of cars, Special Agent Oso toys, Mickey and friends from our Disney trip earlier in the month, and lots of other little bits and pieces. Grandma Irene gave him a toy garage and a desk, and Grandma Phil and Grandad Alan gave him a Martian Moon House, complete with rocket ship and moon mobile!" I used some Echo Park Wintertime papers, die cut snowflakes and the title was cut on my Craft Robo from a Silhouette design. Here's a layout that I made last year with a lovely series of pictures that my mum had taken when we had been at their house for lunch one day in November 2009. Jamie would have been around 10 months old here and was smiling and laughing away like nobodies business sat in his high chair! I used some positively ancient stash on here - Heidi Swapp ghost letters (at least I think that's what they were called! ), Jenni Bowlin paper, and some Bazzill on the edge strips. I cut the frame out for the pictures in the craft robo, and rather than it just being a piece of card with pictures on top, it has apertures cut out and the pictures are underneath, if you see what I mean. Much easier to line it all up nice and straight that way!